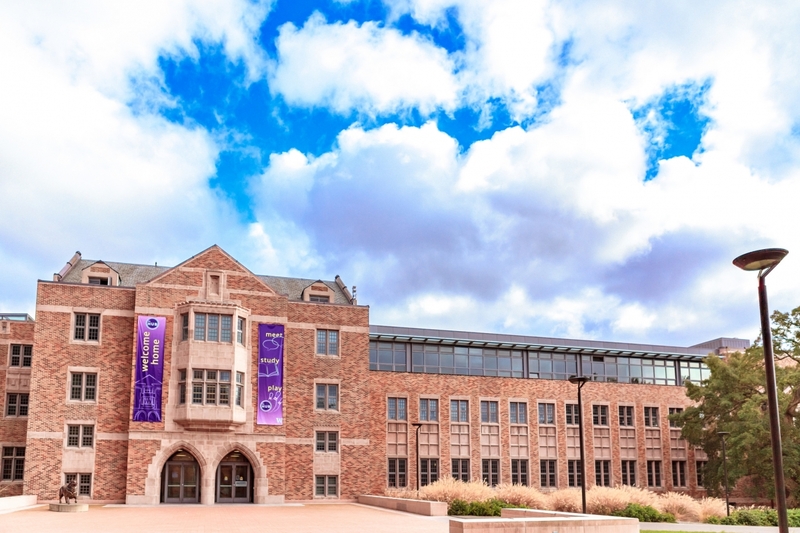 The University of Washington is a leader in campus sustainability. 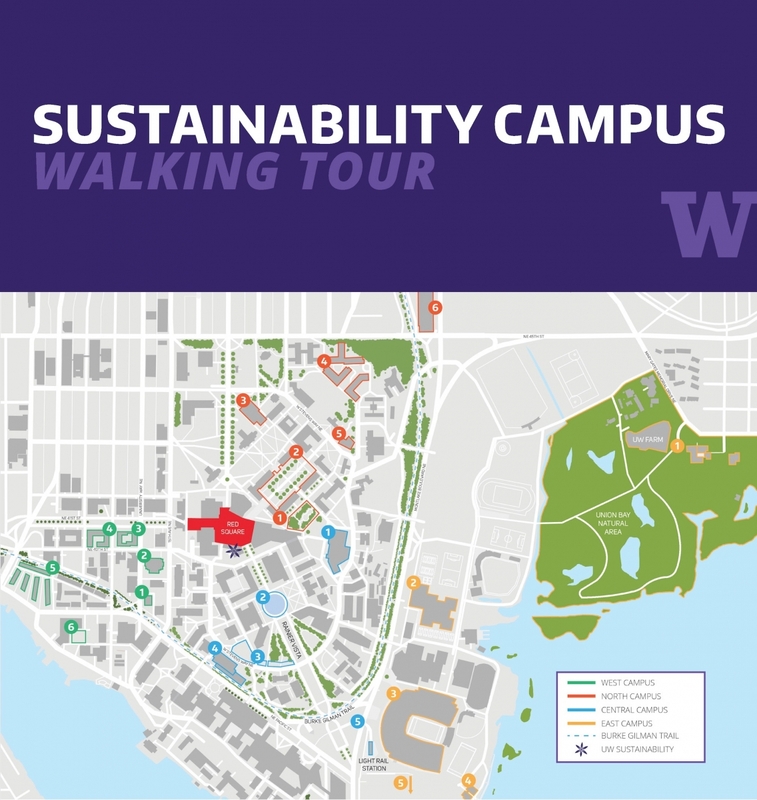 Our Sustainable Campus Walking Tour map showcases just a few of UW’s most visible sustainability highlights; buildings, green spaces and other points of interest. As you walk through campus, you’ll see many sustainability features, such as the conveniently located solar-powered trash, recycling and compost bins; bike parking racks, lockers and cages along with self-service repair stations; electric car charging stations; local and organic food choices; and much more. You can also visit our more detailed campus sustainability map to see more sustainability points of interest. Click on the map image to download a PDF version. West Campus Utility Plant - WCUP supplies chilled water and emergency power to buildings on the west side of the UW’s campus. One of the plant’s visible sustainability features are the rain gardens to filter runoff. Video screens facing the street display information and stories about sustainability at the UW. Biodiversity Green Wall - Hanging on the east side of Gould Hall are two large green walls, featuring primarily native plants that provide habitat for birds and insects. The green wall utilizes recycled rain water and reduces building energy needs by capturing heat during the day and releasing it at night. The wall was funded through a Campus Sustainability Fund grant. District Market/Husky Grind - UW Housing & Food Services (HFS) is recognized as a national leader in sustainable dining, and emphasizes organic, local and fair-trade food on campus. District Market includes fresh produce and a full-service deli. Enjoy a cup of ethically sourced coffee at Husky Grind. Local Point - This HFS campus dining location offers many different food options with sustainability in mind. Look for the plant-forward selections available at Tero, part of the “Menus of Change” initiative. Mercer Court - These residence halls feature rooftop solar panels, as well as a cistern which stores and filters rainwater to provide water for laundry. The space between the buildings is used by the UW Farm to grow produce. 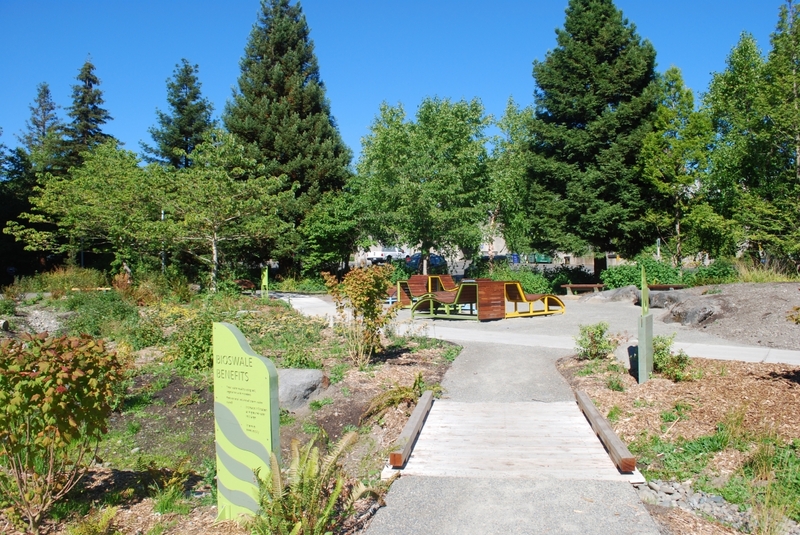 Sustainable Learning Space - This student-designed garden space features native plants, hand-crafted wood benches, nature-themed quotes, a bioswale and rain garden. Funded in part by a Campus Sustainability Fund grant, the space serves as an outdoor classroom and community space as well as a memorial to former Program on the Environment administrator Tikvah Weiner. Grieg Garden - This hidden space is especially cozy during springtime when rhododendrons and azaleas fill the area with a variety of colors. Enter the lush green space and you may find a number of different wildlife species, including heron nests. A statue of Norwegian composer Edvard Grieg looks out over the secluded space. Learn more in this video from the College of Arts & Sciences. Look for a Wildlife Tree as you leave the Garden on the way to the Quad, a dead tree left standing to provide food, shelter and a nesting area for birds and wildlife. Quad - The Liberal Arts Quadrangle is one of the most iconic spots on the UW campus. Each spring, visitors flock to the Quad to see the cherry trees in bloom. 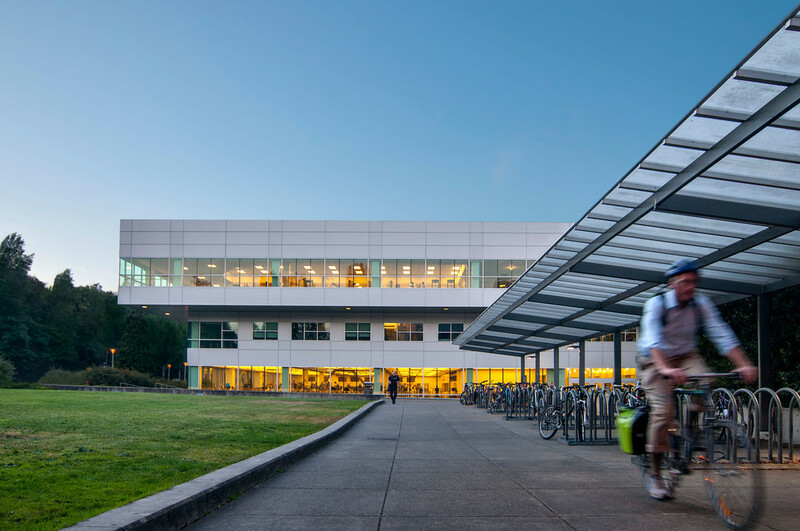 Paccar Hall - This LEED Gold certified building is home to the Foster Business School. It includes many sustainability features, including energy and water conservation measures, utilizing natural light throughout, and a green roof. North Campus Residence Halls - The new Madrona Hall, McCarty Hall and Willow Hall buildings incorporate many sustainability features. The residence halls include spaces for shared learning opportunities to foster community, and the landscaping around the buildings was created with pedestrians in mind. Willow Hall also houses the Center Table dining facility, which includes allergen-free and globally-inspired food stations. 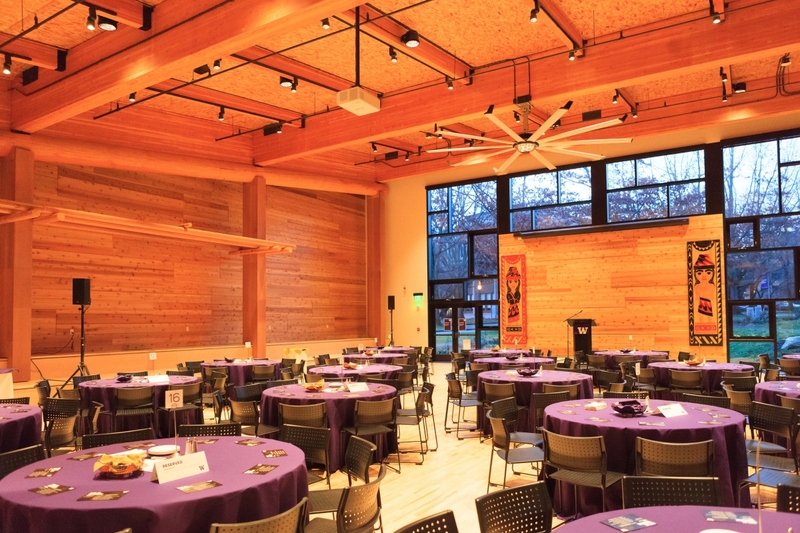 wǝɫǝbʔaltxw Intellectual House - wǝɫǝbʔaltxʷ – Intellectual House is a longhouse-style facility on campus that serves as a multi-service learning and gathering space for Native American students, faculty and staff. The goal is to increase Native American students’ success at the university and prepare them for leadership roles in their tribal communities and the region. UW Surplus Store - UW Surplus takes all unwanted items from UW departments and works to reuse, repurpose or recycle these items. The surplus retail store is open to the public Tuesdays 12-6 p.m.
Husky Union Building (HUB) - A 2012 renovation added sustainability features to the HUB, which was recognized as a LEED Gold building. During the renovation, almost 50 percent of the material from the old building was recycled into the new one. The building is energy efficient, heavily utilizing natural daylight, as well as a chilled water loop system to provide cool air. In the downstairs bowling alley, you can spot many features made from wood salvaged from the renovation. The HUB also provides a base for many student groups committed to sustainability. Drumheller Fountain - The fountain was originally built for the Alaska Yukon Pacific Exposition in 1909, and is one of the most iconic sites on campus. From this spot, you can gaze down Rainier Vista to Mt. Rainier, a reminder of the connection between the university and the surrounding natural landscape. The fountain serves as a resting spot for waterfowl, and in the spring ducklings can often be spotted enjoying a swim. Medicinal Herb Garden - The UW Medicinal Herb Garden is home to about 1,000 plants from around the world, spread out across seven plots, and provides a relaxing escape from the surrounding campus. 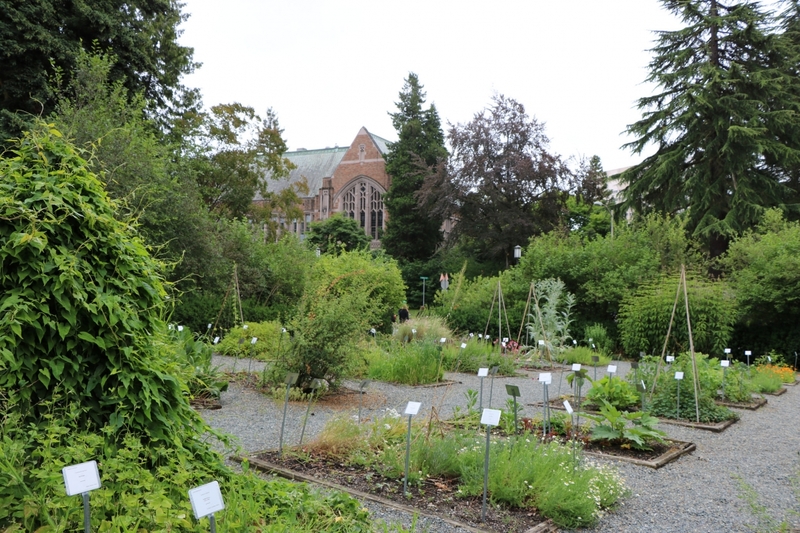 Although the Medicinal Herb Garden is now purely a display garden, the UW Pharmacy Department once used it for medicinal purposes and research. Today, at 2.5 acres, it’s one of largest public gardens of its kind, housing healing plants from just about every continent. Life Sciences Building - This LEED Gold building includes innovative sustainable features such as reusing water to irrigate the greenhouse plants. The glass fins that shade the south side windows have embedded solar cells which generate electricity. Sustainable Commuting Options: UW Light Rail Station and Burke Gilman Trail - The Burke Gilman Trail was once the site of a major railway. Now, it’s both a recreational gem and an effective method of sustainable transportation to and from campus. 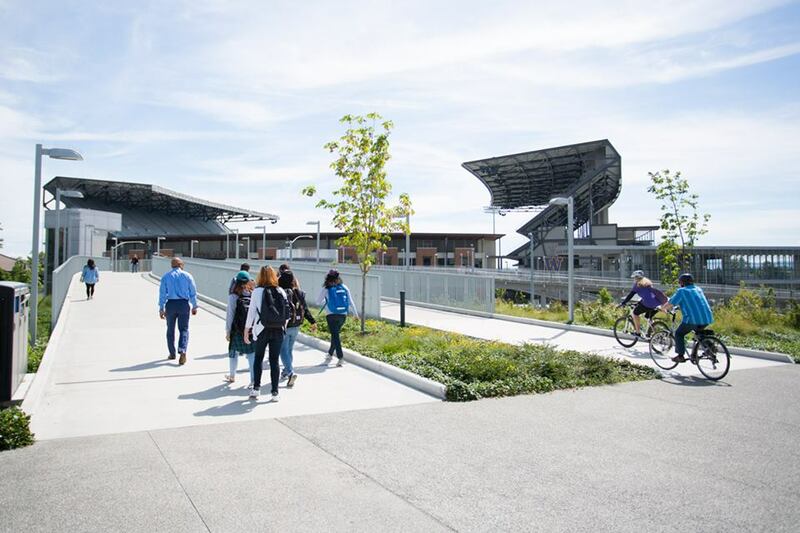 Users use the trail to bike, walk, and connect to public transportation, including the UW light rail station near Husky Stadium. Center for Urban Horticulture - The Center for Urban Horticulture, administered by UW Botanic Gardens, offers 90 acres of demonstration gardens and natural areas, and houses the Miller Library and Hyde Herbarium. The Center serves as an educational hub for UW students, providing a base for research studies and classes, while also serving as a resource for the larger community. UW Farm - The UW Farm is a 1.5 acre student-powered urban vegetable market garden. 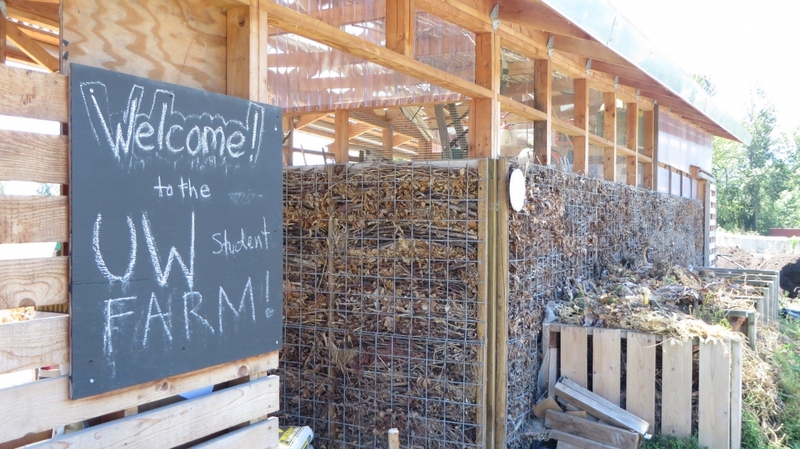 The UW Farm’s mission is to be the campus center for the practice and study of urban agriculture and sustainability, and an educational, community-oriented resource for people who want to learn about building productive and sustainable urban landscapes. The farm has three locations on campus, with the largest being at the Center for Urban Horticulture. Here the farm has about an acre of land dedicated to growing sustainable fruits and vegetables and a hoop house used to grow the more delicate crops and a new composting toilet made possible by a Campus Sustainability Fund (CSF) grant. Union Bay Natural Area - The 74-acre Union Bay Natural Area located at the Center for Urban Horticulture provides trails for running and walking with access to view the waters of Lake Washington and the many waterfowl that over-winter there. 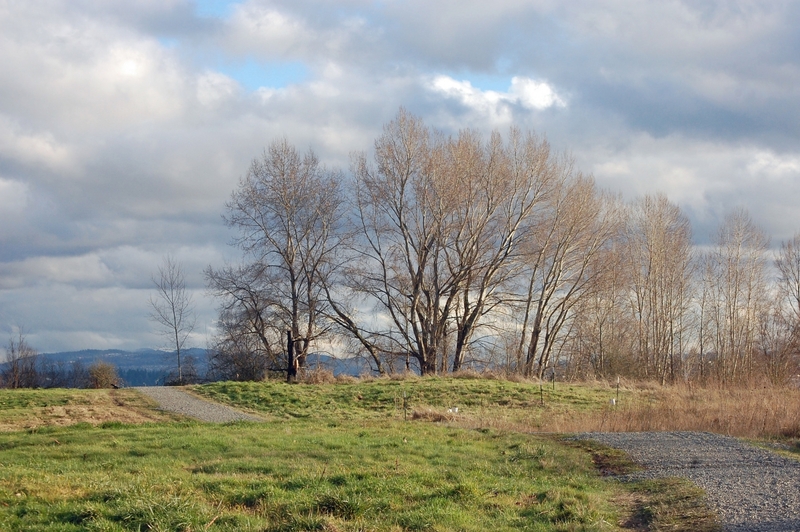 Yesler Swamp, located on the east side of the Union Bay Natural Area, offers a boardwalk loop that takes you to the edge of the lake and the site of the old Yesler Sawmill. IMA - The Intramural Activities Building has several sustainable features that help conserve energy and water in the building. The IMA recently converted nearly all of its lighting to energy-efficient LED bulbs, which not only require less electricity but also last longer than traditional bulbs. From the upper floor running track, you can see the roof-top solar array, one of the largest solar installations on campus. 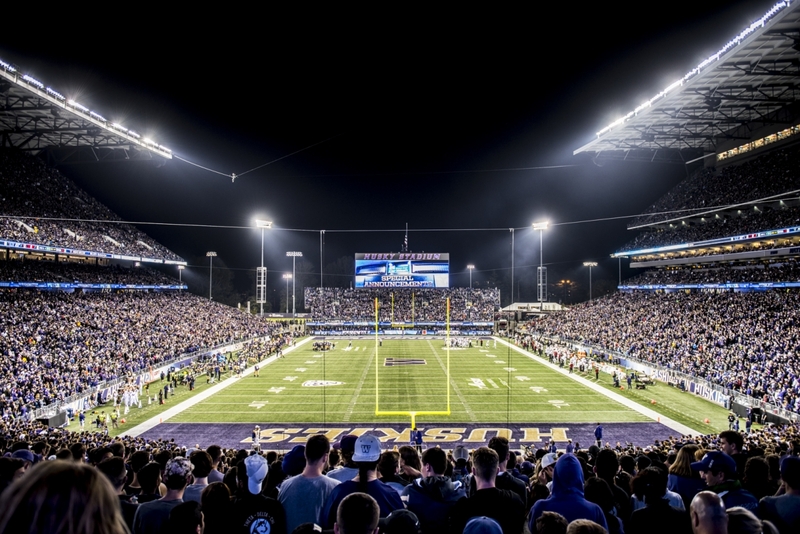 Husky Stadium - During the stadium’s 2012 renovation, more than 95 percent of the construction waste was reused or recycled, and the construction used Salmon Safe practices to filter all wastewater. The slats behind the large W above the entrance gate are reused bleachers from the former stadium, and around the building you can spot native plants in the landscaping, which help filter rainwater runoff. Waterfront Activities Center - Rent a kayak, canoe or rowboat to experience the Union Bay Natural Area’s wildlife and landscape, or paddle over to the nearby Washington Arboretum. 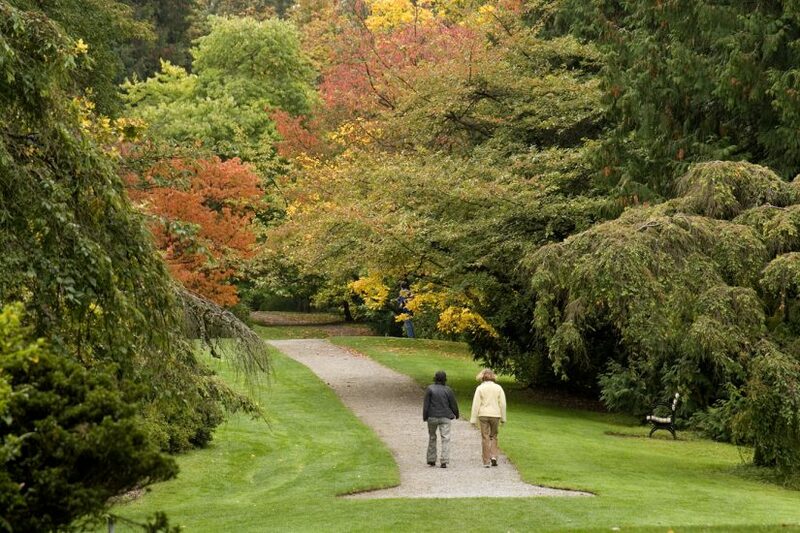 Washington Park Arboretum - The Washington Park Arboretum, administered by UW Botanic Gardens, is just a 1.2 mile walk from UW's Seattle campus. 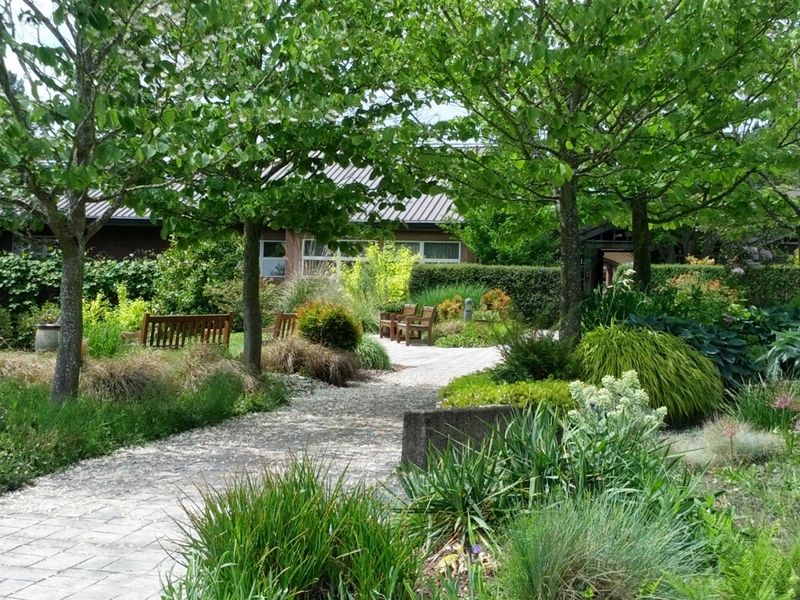 The Arboretum holds a world class collection of woody plants that can be explored independently, through self-guided tours, arranged tours, or through the many classes and activities hosted at the site. All year round you’ll find something of interest along the trails that wind through 230 acres of gardens, natural areas and wetlands. Download a PDF version of this map.